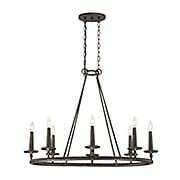 Cool, sleek sophistication is written all over the Downtown 5-Light Chandelier. Gleaming, glass ball accents complement the opal etched-glass drum shades and shiny chrome finish - bringing a soft, modern sensibility to your home. 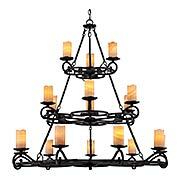 Moorish, Spanish, and Gothic influence runs throughout the Voyager Three Tier 24-Light Chandelier. The hand-forged scrollwork and hammered metal frame are finished with a bronze patina for a wonderfully aged effect. 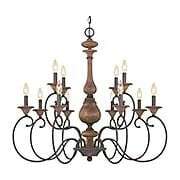 Creating a romantic ambiance, it makes a stately addition to your large dining room or open staircase. 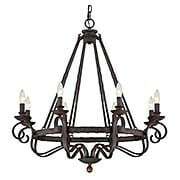 Moorish, Spanish, and Gothic influence runs throughout the Voyager 8-Light Chandelier. The hand-forged scrollwork and hammered metal frame are finished with a bronze patina for a wonderfully aged effect. 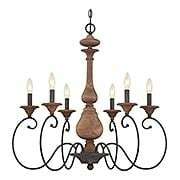 Creating a romantic ambiance, it makes a stately addition to your dining room, bedroom, or entry. 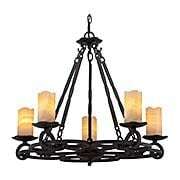 Moorish, Spanish, and Gothic influence runs throughout the Voyager 6-Light Chandelier. The hand-forged scrollwork and hammered metal frame are finished with a bronze patina for a wonderfully aged effect. Creating a romantic ambiance, it makes a stately addition to your dining room, bedroom, or entry. With its steampunk inspired roots, the Union Station chandelier brings industrial style to both traditional and modern interiors. Dense mesh forms the metal frame, allowing the warm glow of the vintage-style bulbs to shine through. Finished in smooth bronze, it features brass accents for a pop of color. 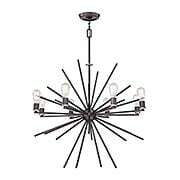 The Carnegie 8-Light Chandelier adds a burst of style to contemporary interiors. 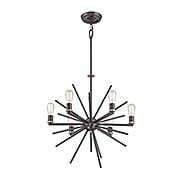 Featuring metal rods in various lengths, a smooth bronze finish, and vintage-style bulbs, this eye-catching chandelier is sure to impress. 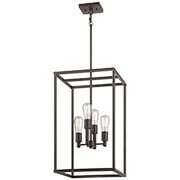 The Carnegie 6-Light Chandelier adds a burst of style to contemporary interiors. Featuring metal rods in various lengths, a smooth bronze finish, and vintage-style bulbs, this eye-catching chandelier is sure to impress. 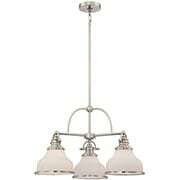 The Noble 3-Light Chandelier exudes old-world charm. Its dark, textured finish highlights each mark on the surface of the hammered-metal frame. Solid wood candle holders, stained in dark walnut, complete the look to create a warm, romantic atmosphere. How perfect for your Spanish Colonial, Tudor, or other European style home! 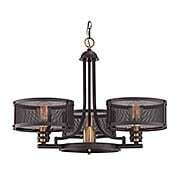 The Noble 8-Light Chandelier exudes old-world charm. Its dark, textured finish highlights each mark on the surface of the hammered-metal frame. Solid wood candle holders, stained in dark walnut, complete the look to create a warm, romantic atmosphere. How perfect for your Spanish Colonial, Tudor, or other European style home! 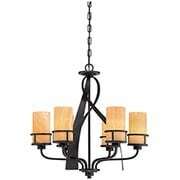 The Noble 5-Light Chandelier exudes old-world charm. Its dark, textured finish highlights each mark on the surface of the hammered-metal frame. Solid wood candle holders, stained in dark walnut, complete the look to create a warm, romantic atmosphere. How perfect for your Spanish Colonial, Tudor, or other European style home! 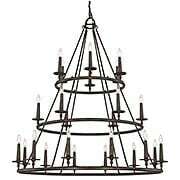 The Armelle Three Tier 18-Light brings a warm, romantic ambiance to your decor. 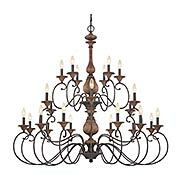 True to its old-world essence, the scrolled details and twisted rods of this chandelier's metal frame are dressed in a rich dark finish. Carved with lovely scalloped edges, each butterscotch onyx shade offers its own unique variation. 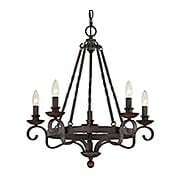 Suited for Spanish Colonial, Tudor, or other European-style homes. The Armelle 5-Light Chandelier brings a warm, romantic ambiance to your decor. True to its old-world essence, the scrolled details and twisted rods of its metal frame are dressed in a rich dark finish. Carved with lovely scalloped edges, each butterscotch onyx shade offers its own unique variation. 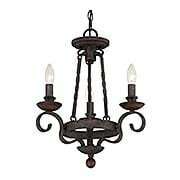 Suited for Spanish Colonial, Tudor, or other European-style homes. The Uptown Theatre Row collection delivers a touch of vintage style in a sleek, modern design. 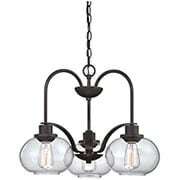 This unique chandelier features Edison-style bulbs encased within an elegant, smooth sphere. It's a handsome addition to dining rooms, entryways, or living rooms. 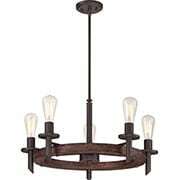 The Kyle collection offers a wide variety of old-world style fixtures, but with a modern twist. Its onyx shades emit a soft glow, the streamlined wrought-iron bands add contemporary flair, and the bronze finish lends a traditional look. 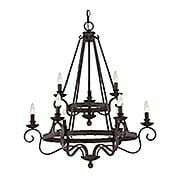 This chandelier creates a warm, romantic atmosphere for your Spanish Colonial, Tudor, or other European-style home. The Tavern collection is a nod back to the days of the old western saloon. Featuring Edison-style bulbs, rich rubber wood (a 100% recycled material), and rich bronze finish, this chandelier delivers a vintage look to any interior. It's ideal for dining rooms, foyers, or bedrooms. Our Grant chandelier is an elegant nod to the past. The classic Americana styling features frosted glass shades with metal accents, a hubble socket, and quirky turned finials. Hung over a kitchen island or dinette table, it adds a nostalgic accent and provides ample lighting for all your daily tasks. 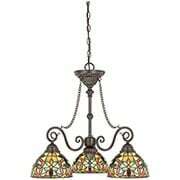 Tiffany Studio's fabulous stained glass inspired this lovely Victorian-style chandelier. The classic floral pattern shade is hand-crafted from genuine art glass in shades of yellow, orange and cream, accented with amber flowers and green leaves. 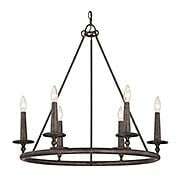 Set into a delicate, bronze finished framework, the effect is magical. For nostalgic flair, look no further than the Emery collection. Sleek and sophisticated, this turn-of-the-century design features classic metal shades and your choice of two popular finishes. 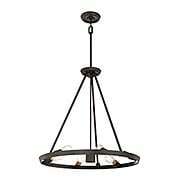 It provides just the right light for your kitchen island, dinette table, or craft table. Cool, sleek sophistication is written all over this design. Gleaming glass ball accents complement the opal etched glass drum shades and shiny chrome finish, bringing a soft modern sensibility to your home. 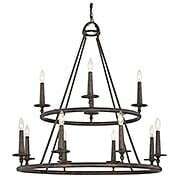 With three tiers and fifteen lights, this grand chandelier is a dramatic addition to your dining room or foyer. Gentle scrollwork and Tiffany-style shades in classic patterns and colors bring sophistication to the Asheville Collection. The genuine art-glass shade is hand assembled, and the valiant-bronze finish anchors the traditional styling. 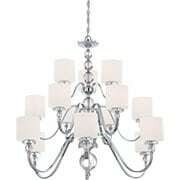 This chandelier is an elegant addition to your dining room, living room, or bedroom. Strands of crystal beads and teardrops adorn this French-inspired mini chandelier. The rustic, Bolivian bronze finish and opulent crystals complement its overall style. The Alston collection, with its attention to detail and design, brings a touch of old-world charm into today's home. The Carrabelle collection brings European elegance and a touch of sparkle to your home. With its cascade of glass orbs, warm bronze finish with gold highlights, and black candle covers, the effect is enchanting. 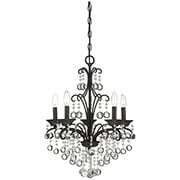 This mini chandelier is ideal for smaller foyers, dining rooms, or bedrooms. The Trilogy collection brings a vintage twist to a modern design. Paying homage to the great innovator, this chandelier features Edison-style bulbs within clear, seedy glass shades and old-bronze finished frame. At home in both contemporary and traditional interiors, it is suited for your dining room, foyer, or, living room. The New Harbor collection is completely unadorned for an open, airy feel. The western-bronze finish complements a variety of interiors, and the Edison-style bulb adds a vintage touch to this understated design. 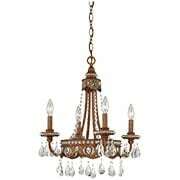 This chandelier is suited for foyers, dining rooms, or living rooms. 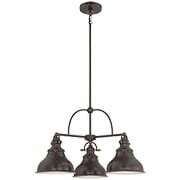 The Kyle 3-Light Chandelier offers a wide variety of old-world style fixtures, but with a modern twist. 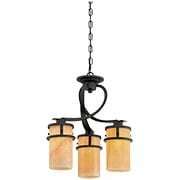 Its butterscotch onyx shades emit a soft glow, the streamlined wrought-iron bands add contemporary flair, and the bronze finish lends a traditional look. 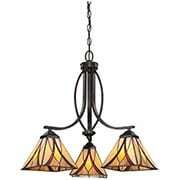 This island light creates a warm, romantic atmosphere for your Spanish Colonial, Tudor, or other European-style home.